Jeremy just mentioned it and as I had the template to hand and it would only take 2 minutes I thought I'd include this one. I've got another schematic which is identical other than the 430p caps which are shown as 500p, but you're always best experimenting with those anyway on a case by case basis to make sure you're avoiding any fizz. Gotta make this. I had one but sold it for insane money on the 'bay. Gilmour, I guess! Build quality was crappy, anyway. The original has the jacks soldered to the board with no support. Great fuzz, huge roar with the tone all the way to the left. Stoney! Heh. I think that's the way all the russian versions are made... At least my Black russian V8 is. Gilmour's PULSE era tones are awesome. This might just be next on the list. I need a Big Muff for bass. I'm thinking either this or the Green Russian. Any suggestions? Green russian. It has more bass than any other BMP. Seems like my bassist friends all want one..
Yup. No surprises here. Verified. Sounds pretty close to V8, but still has some different color to it's tone. Maybe a bit more bassy than black russian, but still much less than green. Nice addition to my BMP clone collection. Thanks! I'll try to come up with as much updating as i can :) Have fun in the sun! do i have to choose transistors with a particular hfe? I just put any in and it sounds great, unless someone can measure the originals I'd say just experiment. I just built this tonight , and it works, but it doesn't have the bite a muff should have. It sounds more like a compressed overdrive or something , but its seriously lacking fuzz. I tried 5089's and Mpsa18's and they both sound the same, great volume and everything just lacking fuzz. I did flub a couple of the values . I used two 220pf's for the 430p spots, and 470ohm in the 390 spots. I had two resistors in series to make 350r at the start and then changed them to 470, the 470 gave a little more bite, but still seriously lacking in the fuzz dept. Any suggestions? This, in to Triangle. Nothing special. Just a double muff. A/B'd this build with my original and they are identical. Great job on the layout! Sounds awes into the repeat percussion. Going to build one of these this week. Is it possible to omit the DPDT switch on this layout without affecting the rest of the circuit? No. Just omit it and your circuit is verbatim with the original. That switch just adds caps to that 3n9 in the middle of the board. Original value is 3n9. @IvIark the 470/500 pF thing - EHX was notorious using what they had on hand and/or was close and cheap. A friend mentioned that if you look over the history of changes to the BMP and note all the changes and that the BMP sound essentially stayed the same is a testament to how great the circuit actually is. I agree. Also for anyone looking - 500pF is also the "Tall Font Green Russian" version. This is the ONLY difference between most Civil War and Tall Font BMPs. The DPDT tone switch while not original as a great mod. This is getting moved to the top of my queue. Thanks for this! are you sure that 10k resistor is right? Maybe I have a bad one but, it reduces the voltage from 9v to 1.45v at the collector of q1. I switched the trannies just to see if I had them in wrong and got the same voltage off the resistor. Line 9 column 3 going from the 9v in to Q4 (not Q1, my mistake). Maybe it's actually the 12 k resistor that's giving me the issue. Crap, sorry. I should read a little more before posting. Checked again. Even at the 12k resistor going to the collector of Q1, I'm only getting 1.5v. Is it supposed to read that low. I must have missed something or maybe a bad solder/bridge. Yes the drain resistors are definitely correct, 12K, 12K, 12K and 10K is what is used in the CW muff. 1.5V is much lower that I would expect though which suggests a problem maybe elsewhere which is pulling it down. What voltage are you getting along row 9, the supply row? If you're using 2N5089's you have rotated them 180 degrees haven't you? I get 9.23v at the supply row, straight across. Pinouts are correct as well. Still getting 1.5v. Odd. I'm looking at the schematic as well and, everything is just as you've laid out. Definitely have an electric vampire in the mix somewhere. Gotta stake that sucker. I'll keep checking. It's gotta be something I missed. Thanks for the help, Mark. Hey guys, my build works and sounds great, though it is always on full gain and rotating the sustain knob doesnt make any difference in Gain. Could that be a bad pot? Marko, something similar to your problem happened to me to, when I first engaged the effect there was even with full volume and sustain just barely signal coming through. I touched the the copper side of the board a bit and found a spot where the wanted sound came through. I fixed the problem in soldering a bridge between the downside lead of the bottom left 430pf cap and the row above on the right side of the cut. Why in Russian models the diodes are next to transtistors' base instead of collector, as in Triangle and Ram's Head? Actually in both muffs, and all transistor based muffs, in the same exact place. The diodes have 1 leg at the collectors, and 1 leg at the base. If you look on the layout you'll see one leg is on either the base or the collector, while the other leg is connected to another part to the second position near the transistor. To make it less confusing. Take a look at the civil war muff above and you'll see the diodes are connected to the base directly, then connected to the collector through the 47nF cap indirectly. Make sense? Yes and no. In Triangle and Ram's the diodes are connected directly to the collector (not the base! ), and then to the base trough the cap. It's not the same thing, I think! The cap's position is different! you happen to be 100% incorrect. 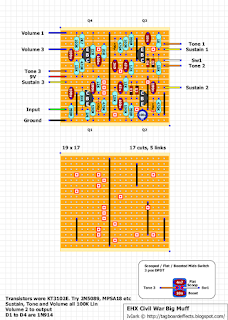 take a look at the schematics posted over at Kitrae, web address below, you can see the schematics for all known dissected big muffs. ALL big muffs, again with the exception of the IC version are identical in their schematics, just with different part values. in the case of the clipping sections, both the 2nd stage, and 3rd stage the clipping diodes are connected to BOTH base and collector. They are connected in the same arranged and is in parallel with a feedback resistor, and feedback filtering caps, and in series with a clipping/blocking cap. 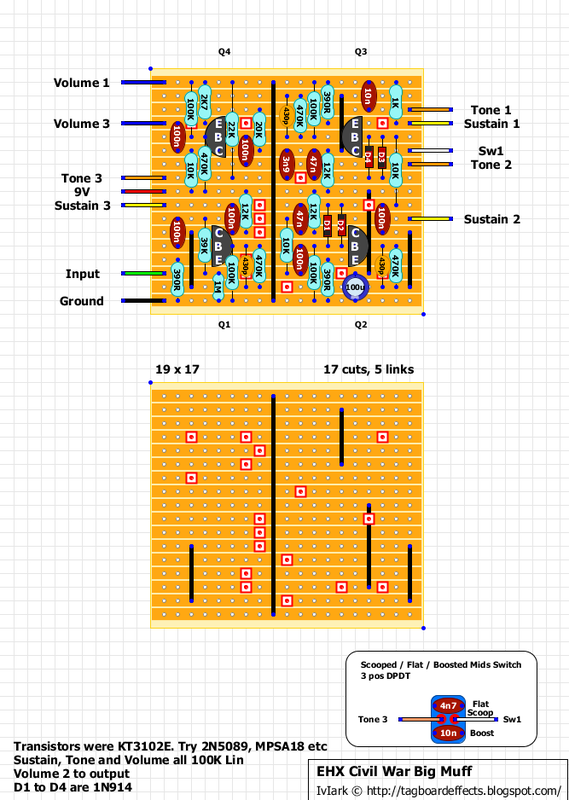 take a look at the big muff schematic explained, address below, also from Kitrae. Hm, ok. I've studied these schematics for days. I try to explain what I mean with some graphs. In KitRae schematics, components are arranged in this way: in series collector, diodes, clipping cap, base. BUT. In Russian veros, components seems to be arranged in that other way: in series base, diodes, clipping cap, collector. This schem would be different (I've photoshopped KitRae schem to explain). i see what you're going on about now. what you need to remember is that electricity doesn't care about order it passes through the components as long as it travels along the correct path. in each of the muffs what gives it it's difference in tone, distortion/fuzz, smoothness, etc. is down to the selection of components. in the case of the russian muff what makes it more bass oriented and smoother is the size of the coupling caps, and the clipping/blocking caps. If I don't want the Mid Mod switch, which is the right connection? where put I the tone 3 cable? and the sw 1? did you ever figure this out? i'm a bit confused on this one as well..
Just a comment re the 500pf/430. I happen to have a Civil War on my bench identical to the one pictured above....it has 500pf "feedback" caps- two 1n in series. I'm only saying this to confirm what we all know, they vary! One other interesting thing I noticed is that all the pots measure low, 63, 84, and 76K for V, G and T respectively. I imagine that that volume pot, in particular, might darken this one up a bit? NOTE, however, that the E B C transistor pinout in the layout above is incorrect for 2N5088, 2N5089, and MPSA18 (at least all of the ones I that I had on hand). When oriented as depicted, you'll get a very "stifled" fuzz -- more like a compressed overdrive. Simply point them in the opposite direction and they'll be aligned properly. As always, verify with the transistor spec for whatever you're using! built this and freakin love it, with some value tweaks it nails the muff sound i was looking for and playing through it is so much fun. like the above poster can recommend socketing a bunch of components to taste, and checking the transistor orientation depending what you use. also i had to add a low value filtering resistor on the main power line to get rid of some power supply whine. Thanks for the layout. I did a build video of it.